According to the report, "There is nowhere in this country where someone working a full-time minimum wage job could afford to rent a two-bedroom apartment," Tracy Jan writes for the Post. "Downsizing to a one-bedroom will only get you so far on minimum wage. 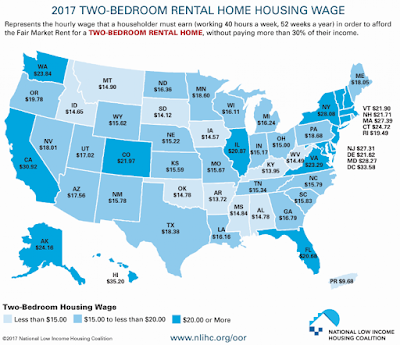 Such housing is affordable in only 12 counties located in Arizona, Oregon and Washington states, according to the report." "The gap between wages and rent is growing," Diane Yentel, president and CEO of the coalition, which has conducted similar analyses for 28 years, told the Post. "There's no doubt that the affordable housing crisis overall has increased since the foreclosure crisis in 2007." "The picture is not expected to improve in the near future as the rental market remains strong and vacancy rates decline," Jan reports. "A record 43.3 million households were renters in 2016, a 27 percent increase since 2006, the report said. Household income, meanwhile, has not kept up with the pace of rent increases."